Sellers “It’s both a price war, and it’s a beauty contest,” You have to stage your house and always keep it in showing condition. If you have an unmade bed and dirty dishes, those two things can affect selling the house. Make your home easy to show can help you sell it quicker and for more money in a sellers market. Buyers one of the best things you can do for your selves is to take time to find a knowledgeable agent and get pre-approved for a home loan. Also, Pick a Realtor who has knowledge of the area and the industry, this is an important decision for your life and your family. Don’t pick someone just because they’re a friend or a relative. Even first-time homebuyers struggling to make a successful offer on an affordable home eventually will benefit from the process, with determination and more knowledge you will win your home. If you can buy, rather than lease, for the tax benefits alone could be beneficial for you and your family. Seller or Buyer in Southern California price war has begun for real estate. Are you looking to sell your home and find another home in Southern California. Do you know someone who is interested in buying or sell a home in SoCal. 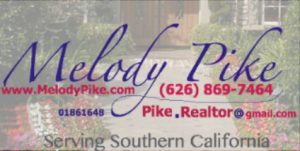 Contact Melody Pike she would love to help you or someone you know.